This is mainly a result of upgrades to existing hotels and not construction of new ones that showed only a marginal increase of 0.7% over the last 5 years. The number of beds and bedrooms in all hotels in the region increased by 2.9% and 4% respectively, with the five-star category showing an impressive increase of 47.1% and 48.1% respectively. These figures, along with the latest trends in the market are included in the most recent report by Algean Property. 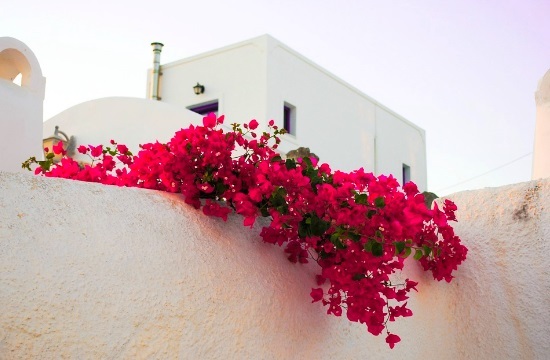 The report concludes that many of the islands of the South Aegean represent significant investment opportunities, with high returns, to foreigners who wish to buy luxury villas in order to gain from the rise of tourist arrivals in Greece during recent years. In 2016, the South Aegean region had a share of 18% of the total arrivals in Greece, ranking second in the country after Central Macedonia. It also had a 21% share in total nights and 24.6% in total tourist revenue, recording the best performance in Greece while coming third in receipts per visitor (600 euros), after Crete (682 euros) and Ionian islands (612 euros). Regarding revenue per night, South Aegean ranked second with 78 euros, after Crete (79 euros). It also showed an average stay of 7.7 days, following the Ionian and Crete (at 8.7 days). For the 9-month period of 2017, the region recorded a significant increase in receipts (+ 15.8%) compared to the corresponding period of 2016 and had a share 25.9% in the whole of Greece. Visits rose by 10.4% to a 19% share, and overnight stays by 3% to a 22.3% share. Revenue per visitor averaged € 647 (+ 7.8% from the corresponding nine-month period in 2016), revenue per night rose to € 80 (+ 0.8%) and average stay reached 8.1 days, with an increase of 3.8%. The impressive performance of tourism in the South Aegean during recent years, has stimulated the demand for purchases and rentals of country houses and villas on the islands. For each island separately, there is strong demand for investors from Germany, Britain, Austria and Switzerland for purchases or rentals of 3-4 bedroom villas, with swimming pool and a high level of infrastructure. As far as Rhodes is concerned, the stock of holiday homes on the island is set to rise in coming years due to a rise in tourism resorts but broader building activity in the sector remains low. Algean points out that Greece's construction industry froze due to the country's debt crisis and a lack of liquidity, resulting in no major changes in the stock of holiday homes. In the last two years, some individual projects have begun developing, though the volume still remains low, it said. Rhodes is among Greece's popular tourist destination set to see the biggest change in the quality and quantity of holidays homes on offer. Rentals on the island are not as developed as elsewhere in the region, yet the market "possesses a certain dynamic one cannot ignore," noted Algean. Holiday home rentals in Rhodes offer a gross average rental yield of 5.6%, versus top performers Mykonos (8.4%) and Santorini (6.4%). "No new developments begun the last few years in Rhodes, resulting in little changes on the island’s holiday home stock," said the report. "However, upcoming integrated tourist resort projects on the island include the construction of holiday homes within their premises, thus increasing the holiday home stock’s quality and quantity," it added. The cosmopolitan island of Mykonos is the top performer in terms of investment return, offering an 8.4 percent gross average rental yield, above its competitors in the Mediterranean Sea. Areas of particular interest are southern locations close to Mykonos Town with a focus on three-bedroom villas with a pool, high-end amenities and sea views. The greatest investment interest comes from Scandinavians, Americans and Britons. The average purchase price is € 5,000 - € 7,000 per sq m. and € 9,000 - € 11,000 per week for rent. The iconic greek island of Santorini ranks second in the Mediterranean in terms of investment return, offering a gross average rental yield of 6.4 percent. Investors with an average budget of 700,000 euros to 1.2 million euros are looking to invest in places offering a view of the legendary island's volcano. The average purchase and rental prices are € 5,000 - € 7,000 per sq m. and € 7,000 - € 10,000 per week, respectively. The biggest demand comes from Germany, France and Italy. Kos is a destination where most visitors prefer to stay in a hotel rather than a villa. The average purchase and rental prices are € 2,500 - € 3,500 per sq m. and € 3,000 - € 5,000 per week, respectively. The biggest demand comes from Germany, Britain and Austria. Paros exhibits one of the top performance returns on investment in the Mediterranean with a gross average rental yield of 6.4%. The highest demand comes from the Scandinavian countries, Germany and France, and the average purchase and rental prices are € 3,500 - € 4,500 per sq m. and € 4,000 - € 7,000 per week. Patmos has a return of 4.8%, the average purchase and rental prices are € 4,000 - € 5,000 per sq m. and € 3,000 - € 6,000 per week. The largest investment interest comes from Germany, the US and Austria. 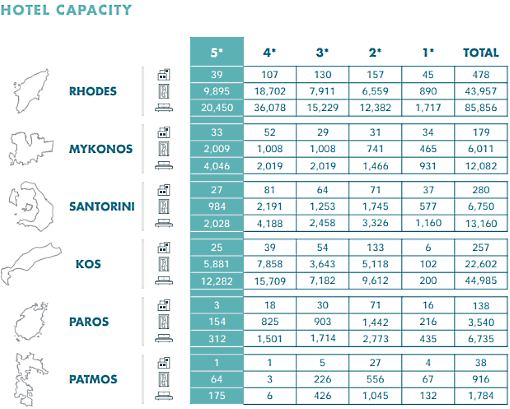 The table below shows the best performing gross rental yields at Greece's main holiday destinations that range from 8.4% to 4.3%.